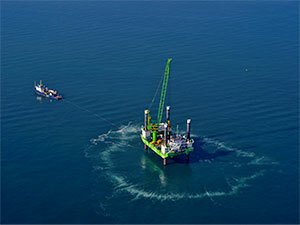 An active bubble curtain surrounds an offshore pile driving installation. Image courtesy of Georg Nehls. Close-up view of a bubble curtain in operation. One can see the streams of bubbles exiting the hose of the bubble curtain. Image courtesy of Georg Nehls. 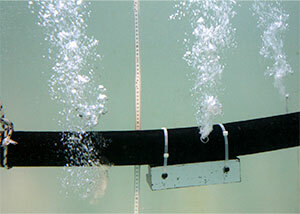 Bubble curtains can be deployed to reduce or mitigate impacts from high noise levels produced by pile-driving. Air streaming from closely spaced release points creates a “wall” of bubbles around the pile. Because air and water have a substantial impedance mismatch, the bubble curtain acts as a reflector. The bubbles also resonate in response to sound and absorb sound energy. Up to a 30 dB reduction in sound has been measured when bubble curtains are deployed with pile driving. How does sound move? Reflection. Reyff, J. A. (2003). Underwater Sound Levels Associated with Construction of the Benicia-Martinez Bridge: Acoustical Evaluation of an Unconfined Air-Bubble Curtain System at Pier 13. Illingworth & Rodkin, Inc., Petaluma, California. Reyff, J. A. (2009). http://onlinepubs.trb.org/onlinepubs/trnews/. TR News, Transportation Research Board National Academy of Sciences, 262, 31–33.